Wildflowers are a joy to photograph. The colors, shapes, and sizes can add so much personal expression and emotion to an image. There is a multitude of creative approaches to employ while developing a vision for the subject. 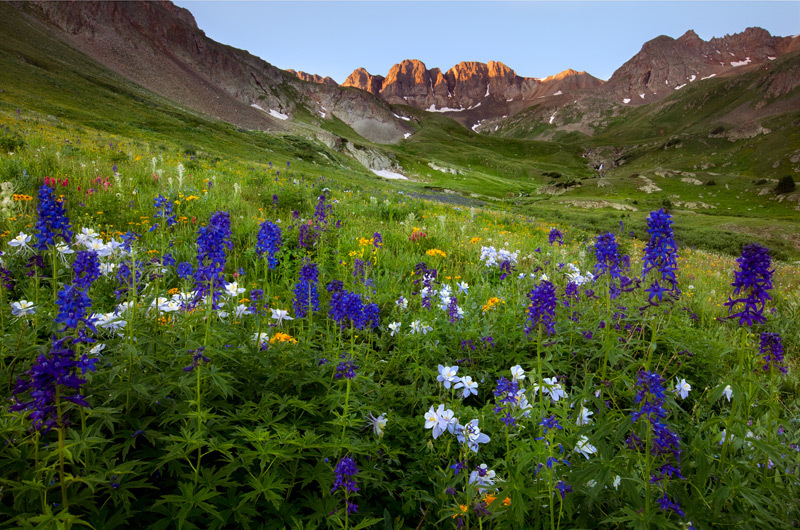 Today, we explore some of the most effective techniques used to capture wildflowers. It is part one of my new series and I hope that you find it useful. 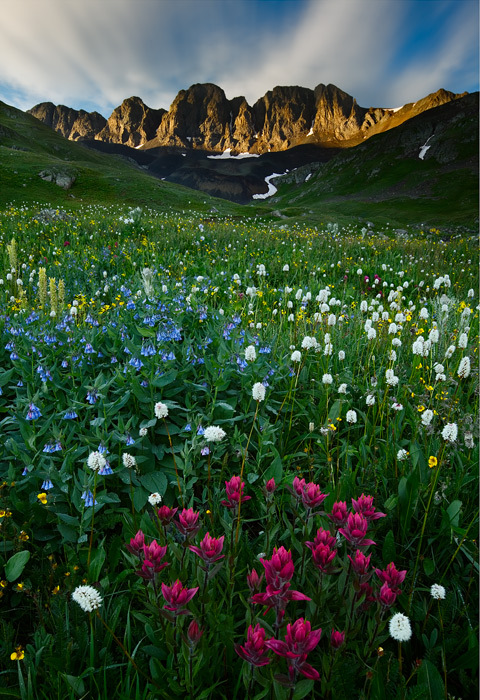 Fields of wildflowers offer the opportunity for show stopping photographs of epic proportions. However, the margin for error is even smaller than normal and proper attention to detail must be precise in order to execute a stunning picture. My first method of approach is to determine a point of view. How low or high do I want to get with my camera? Obviously the lower the perspective, the more prominent your foreground. This technique increases drama and brings your viewer into the picture. However, there are potential hindrances as well. For instance, what about the flowers directly behind your foreground? Are they colorful and do they add or detract from your image? Would an overview of the area work better than getting low to the ground? Remember, a moving your camera just a few inches up or down or to either side can truly affect your composition, so be aware of everything you are photographing. Take your time, look around, and experiment. A stunning floral display accentuated by a glimpse of rare alpine light. The angle of the field of flowers and the varying lengths of growth worked wonderfully for this photograph. The heighth, width, and overall size of the wildflowers plays a huge part in composition as well. Smaller and stocky wildflowers are generally easier to capture than taller, lanky ones because they don’t catch as much wind and they don’t obscure other flowers. On the flip side, the large ones take up more space in your composition and the differences in height can add texture and variety to your pictures as well. In addition to size, the spacing of flowers is critical. Are the flowers evenly spaced or do they occur in clumps? Is the color evenly distributed across your image or is it unbalanced? Finally, are you looking to photograph an entire field or prominently capture one clump? My approach: Find the biggest and best fields of flowers and work around that. I prefer as many flowers in my images as possible. Best advice: Experiment with both vertical and horizontal compositions of the same scene. More often than not, I find my first hunch for presentation is wrong when photographing scenes with wildflowers. Wind is the biggest natural obstacle in successfully executing wildflowers shots. It doesn’t take much, just a little breeze to really mess things up. Fortunately, in today’s digital age we can overcome many natural limitations by exercising a little bit of patience and creativity. Let’s go over some techniques that can help. Wind played a major factor in the capture of this shot. Multiple blends were necessary to keep the flowers from moving and to blend for depth of field. The differences in color from the previous image are mostly a result of a much warmer white balance or higher color temperature used as the basis for editing this picture. 1) Take off the polarizer – In one of my all time favorite photography books I learned that a polarizer should not be used within an hour of either sunrise or sunset. While this filter can be very useful in reducing glare while photographing wildflowers – if wind is an issue and it is a sunrise or sunset – take it off and spare yourself the extra exposure time. 2) Utilize your ISO speed – Depending on the quality of your camera and the size of your print, ISO speed can be raised considerably without any noticeable decrease in quality. That is, if exposure and focus are correct coupled with the right aperture settings. For example, I recently compared a 16 x 24 print shot at ISO 400 with another shot with the same camera and lens at ISO 100 and I literally could not tell any difference in quality. Getting back to the flowers – unless it is deathly still – try to keep your exposure times to less than one half of a second to prevent any kind of motion blur in your flowers. My approach: Take lots of pictures of the same composition and blend out the blurry flowers if necessary. Best advice: Be patient – wait for the wind to die down. Even if the light changes – you still have a chance of pulling off a successful blend. We’ll stop here for today and pick up this topic next week with more tips and techniques for capturing wildflowers. If you like post or have any tips of your own – I’d love to hear from you! This week’s blog is on how to to craft successful abstract images in landscape photography. We will talk about what to look for, how to express yourself, and also discuss technical tips in the field. I also want to give you a brief professional update as a lot is going on. We recently returned from a wonderful eight day trip to Oregon. More on that in a later blog. Next week we are preparing for our first trip to San Diego to participate in the renowned La Jolla Festival of Fine Arts. Today our focus is on abstracts. Abstracts offer a lot of opportunity for a number of reasons and make a fine addition to any landscape photographer’s portfolio. To begin, abstract images are less contingent upon spectacular light. In many cases soft, diffused light works best. This is usually true for abstracts involving plants and trees. Depending on the size of your subject and the photographer, wily shooters can use their bodies, jackets, reflectors or anything else capable of casting a shadow on their subject matter. So sometimes you don’t even have to wait for the light! In other instances, photographers use the reflected glow of the sun to help add drama and color to their images. This works best while shooting in slot canyons or while shooting intimate scenes of water that capture the varied colors of reflected light. Below is a demonstration of how different kinds of direct light can affect the color quality of abstract images. Abstract photos normally normally rely on repetition or pattern. This can be expressed in colors, lines, shapes and accentuated by depth. This type of image best allows the photographer a means to express him or herself creatively in ways that will set them apart from others in the field. 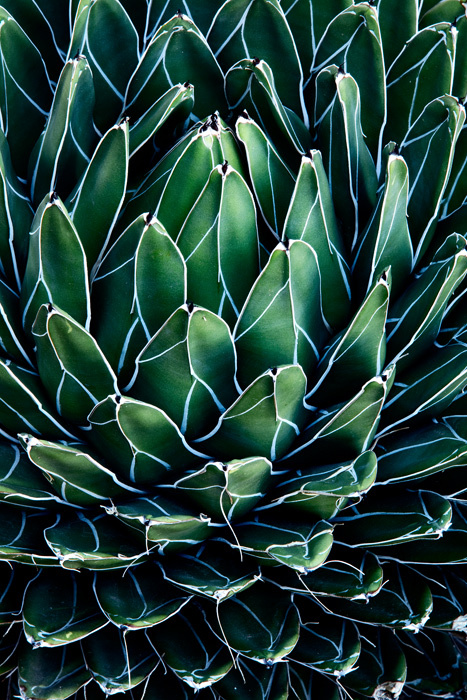 I used a high contrast interpretation of this mescal agave plant to accentuate its dominant features and colors. Another critical consideration is the photographer’s technical execution in the field. This can be the make or break difference in determining the dramatic impact of the image. Considerations such as what aperture to use to showcase depth of field, what kind of exposure works best to capture the subject matter and it colors, will using a filter, like a polarizer, help improve the scene? These are all personal choices left up to each photographer. The best advice I can give is just to experiment with local subject matter. My best abstracts have all been local. There is something about familiarity when it comes to abstracts that has really helped me find my style. It difficult to put into words, I guess it is more of an instinct than it is a tangible quality. For instance, I live in the desert. So when I am out and about I am looking at desert landscaping and watching the plants for patterns or shapes that interest me. I might find one that I like and maybe the scene doesn’t work or I don’t have my camera gear, but it gives me an idea of something that interests me that I continue to look for in the future. That’s my suggestion to you. When you are around mundane subject matter, pay attention to the little things – even if you don’t get shots it can inspire you for the future. Speaking of which, I hope you find this article inspiring. Please let me know if you do! In December 2004, I ventured into the Rincon Mountains of Saguaro National Park East for my first solo backpacking trip. It was a trip that I’ll never forget. For those of you that don’t know, the Rincon Mountains are part of the “sky islands,” a group of mountain chains in the Coronado National Forest of southeastern Arizona that draw their name from the extreme biodiversity found within the topography. The largest of the sky islands is Mt. Graham. At 10,720 ft, it is also the third highest peak in the state. The Rincon Mountains top out at 8,664 feet, but draw distinction as being some of the roughest mountains in the state. A few years back, I read a book about hiking the Arizona Trail and the author claimed the Rincons, which traverse the state from north to south, were the most difficult part of the 772 mile hike. Although there are over 100 miles of trails in the Rincons, there is one trail that serves as the artery into the park. It’s called the Tanque Verde Ridge Trail and it’s the one most backpackers use. It is an 18 mile trail (roundtrip) that journeys on the spine of the Rincons into the heart of the mountains. From its terminant, it is a manageable day hike to reach the top of the mountains. Joyce and I are back from an awesome weekend in Tucson. I have to say that here in Phoenix, the city of Tucson sometimes is portrayed negatively and unfairly (in my opinion) by many of the local print publications. 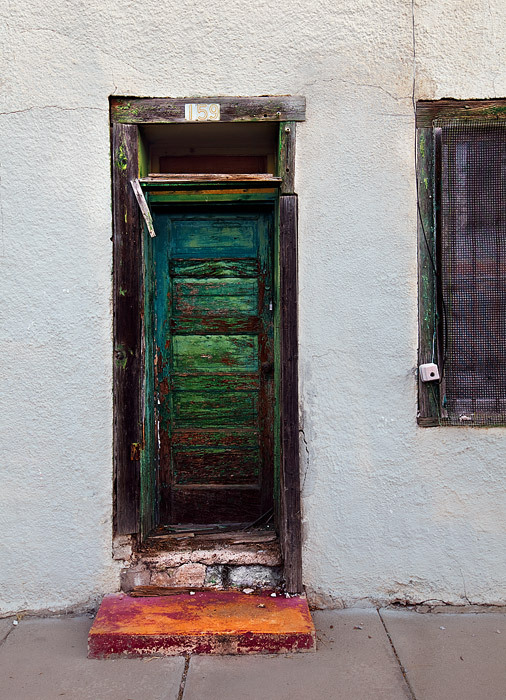 It is unfortunate because Tucson has a ton of character on its streets that really isn’t as evident here in the valley. Although it has grown dramatically in the past ten years, it still maintains the feel of its Spanish roots. Tucson has also down a good job of preserving historic sites. The Mission at San Xavier del Bac just south of the City is a shining example painstaking preservation efforts. In addition, Tucson has some killer mountains on all four sides and probably the best saguaro forests in the country. 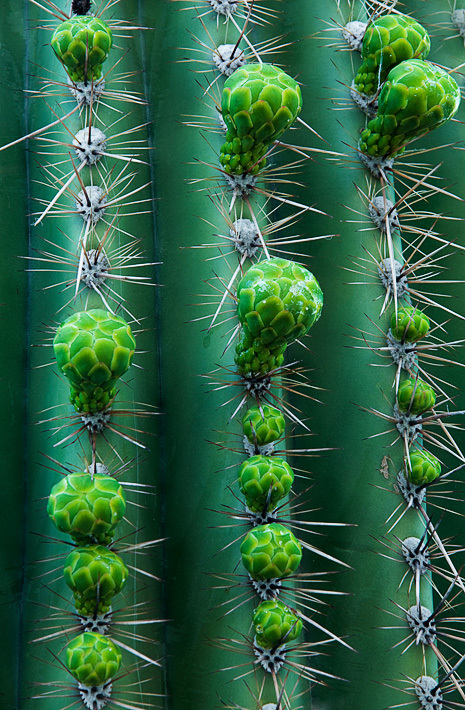 Saguaro National Park is a must do trip on any visit to the Tucson area. Today I want to talk about the Tucson barrio. As many of you may know, I volunteer for Friends of Arizona Highways Photo Workshops. It was through the Friends organization that I first learned about this amazing place. They do a workshop there in the spring and reading about this place captured my imagination. I’ve always been interested in photographing doors and this was a perfect opportunity to do so. The brilliant colors and unique architectural features in the barrio are mesmerizing. With a weather forecast of clear, blue skies all weekend long I thought this would be a perfect opportunity to capture some urban art in the heart of the “Old Pueblo.” Joyce and I spent several sunrises there capturing the colors and atmosphere of the unique barrio. Below is one of my favorite images from the trip…. The barrio is a really cool place if you are interested in this type of photography. 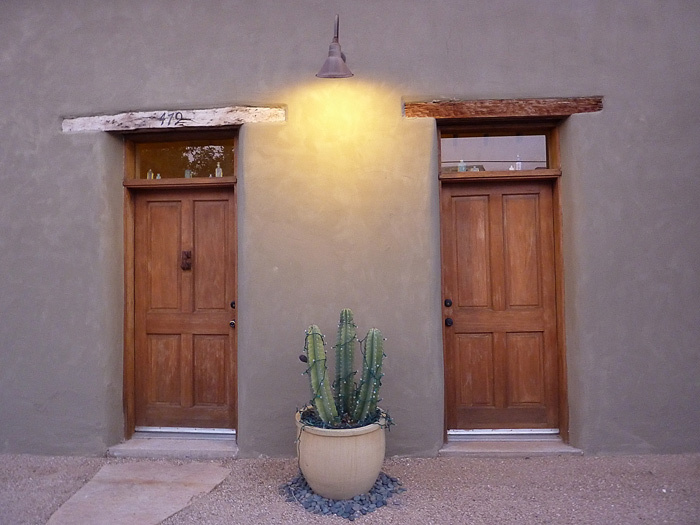 We felt the best location was in the vicinity of Stone and Cushing streets in downtown Tucson. If you are ever in the area, it is definitely worth a look. My next post will most likely be on Monday, until then, have a fantastic weekend! Before we get into the photography tips, here’s a quick personal update on the latest happenings in my photography world. The first big festival of the winter is upon us and we are making final preparations for a successful show. Our inventory is fully stocked, show pricing is in place, and we have several options of styles including framed and matted prints, notecards as well as canvas giclees. 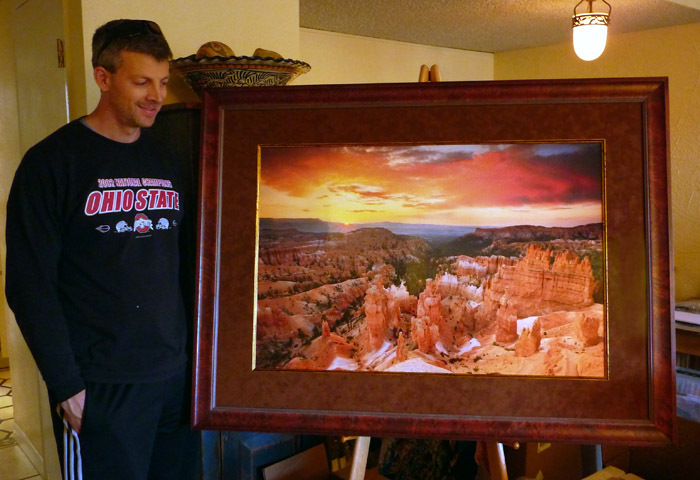 For this show, we also made a couple of large prints including my bryce canyon sunrise shot entitled, “Celestial Alignment” at 24 x 36. That’s my largest print to date, we just got it home this afternoon and here’s a quick snap shot with me in it to give you a sense of size. Including the matting and frame – the image is 49 inches wide. One of my showstoppers for Tempe this year. This is a 24 x 36 Lightjet print on FujiFlex paper with distressed gold trim, suede matting, museum glass, and a Southwestern wood frame. For more information on purchasing this piece...please contact me. Now onto my photo tips. Ron, my contact at Induro Gear, asked me to submit my top five photography tips and he published that article on the Induro blog earlier this week. You can read it here. I hope you all had a wonderful Thanksgiving. I apologize for not updating my blog for frequently. This has been an incredibly busy time. You can expect me to update the blog at least once per week from now until the new year.